The accommodations at this oceanfront North Myrtle Beach resort are perfect for the couple seeking a romantic getaway, the family with several kids in tow, the active retirees who love to swim and the golf foursomes wanting to hit the links. 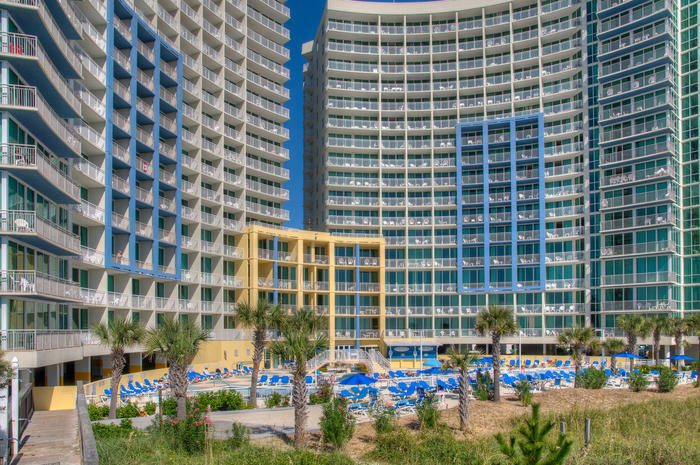 Avista Resort is a high-rise North Myrtle Beach resort with one-, two- and three-bedroom condominiums. The most spacious North Myrtle Beach rentals have three private bedrooms and most are furnished with sleeper sofas in the living room. These North Myrtle Beach condominiums sleep 10 or 12 people. The kitchen in these condos in North Myrtle Beach, SC features full-size appliances, even a dishwasher. You might find a breakfast bar in the kitchen of the three-bedroom North Myrtle Beach rental you choose. Opt for a three-bedroom North Myrtle Beach condominium with a washing machine and clothes dryer. Some have Internet access and most of these North Myrtle Beach rentals have at least one DVD player. The elegant two-bedroom North Myrtle Beach condominiums have two baths and sleep eight or 10 people. The kitchen is furnished with full-size appliances, cookware, dishes and utensils for your convenience. You can find high-speed Internet access is many of these North Myrtle Beach rentals, too. For a cozier North Myrtle Beach vacation, reserve a one-bedroom, one-bath North Myrtle Beach condo at Avista Resort. These charming ocean view North Myrtle Beach rentals are furnished so as to accommodate between four and eight people. The galley kitchen in these efficient condos in North Myrtle Beach, SC has a refrigerator, microwave, oven/stove and a small dishwasher. There are indoor and outdoor water features at this North Myrtle Beach resort in addition to being right on the oceanfront. So with the Atlantic Ocean in the background your family can swim in a number of swimming pools and lounge poolside during your North Myrtle Beach vacation. The oceanfront sun deck features two pools, two hot tubs and a kiddie pool with a mushroom waterfall. The lazy river on this pool deck is phenomenal. It is quite long and winds under a three-way bridge. The covered pool deck at Avista Resort boasts another swimming pool, a second lazy river and a large whirlpool. Your family will gladly spend hours enjoying the water amenities at this North Myrtle Beach resort. This oceanfront North Myrtle Beach resort features a restaurant, pool bar, lounge and even room service for you to enjoy during your North Myrtle Beach vacation. Just Off Main is on the first floor of Avista Resort and offers delicious breakfasts, delightful lunches and dinners with a wine list. When you feel like staying in one night of your North Myrtle Beach vacation, make it a special evening and dine at Just Off Main. The Sip ‘n Dip is a pool bar. It is between the outdoor swimming pool and the white sandy beaches. This convenient pool bar features sandwiches, salads, beer and frozen drinks on its menu. Try the jalapeno poppers before dining on a taco salad. Or order the steak sandwich for you and peruse the children’s menu for the kids. The daiquiris and pina coladas are especially refreshing. Finally, the Tree Top Lounge is a wonderful way to end your North Myrtle Beach vacation day. Open until midnight, this art deco hot spot is on the fourth floor of the North Tower. Play pool and munch on half-priced appetizers during happy hour. If you want to relax in the comfort of your North Myrtle Beach vacation rental at Avista Resort but don’t want to run out to get something to eat, order room service. After indulging in rich cuisine and treating yourself to delicious seafood buffets, you can spend a few minutes in the on-site fitness center at Avista Resort. There are cardio machines so you can get your heart rate up and strength training equipment so you can keep your body in top shape for the days you spend on the beach in your bathing suit. Avista Resort is in the Ocean Drive section of North Myrtle Beach, SC and it is just a couple blocks north of Main Street. Walk three blocks to this main drag and enjoy the cafes and boutique shops where you can get some delicious seafood and unique gifts. The beach clubs feature live beach music and the dance floors quickly fill with shag dancers at these hot spots. Being within walking distance of those amusements and attractions makes this North Myrtle Beach vacation that much more convenient and memorable.